Along with the price, the outlet, run by Cataloghouse Ltd. in Tokyo’s Shinbashi district, displays the cesium level found in the fruit or vegetable. 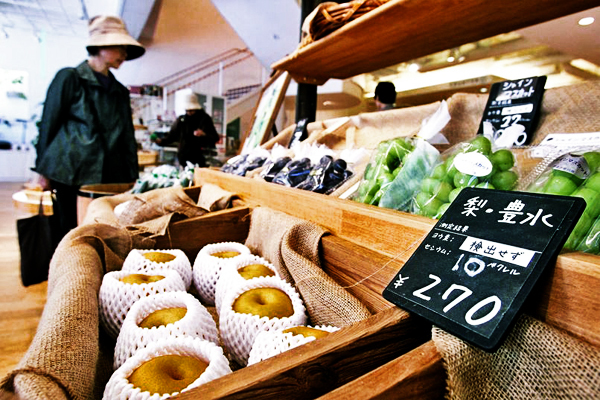 If the radiation detection device installed in the outlet detects radioactive iodine or cesium in any produce, the figure is displayed next to the produce. The device can detect radiation levels of at least 10 becquerels per kilogram. The outlet has a special corner where it sells produce from Fukushima Prefecture. The area features 22 fruits and vegetables produced by J-Rap Inc., a group of farmers in Fukushima, and sells rice produced by the group from before the March 11 Great East Japan Earthquake. Customers are provided with a list of radiation level standards established by various nations. The list includes the figures for the Ukraine, which has established standards much stricter than those in Japan following the Chernobyl accident in 1986. For example, while the radiation levels for fruits and vegetables in Japan are 500 becquerels per kilogram, in the Ukraine the levels are 40 becquerels for vegetables and 70 becquerels for fruits.